Our Custom Self-inking Date Stamps are the Best Available. Choose from the lightweight Shiny E series or the heavy duty Maxstamp PSI series. 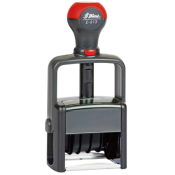 All deliver smooth operation and thousand of impressions before replacing the ink pad or re-inking with Rubber Stamp Ink. Impression Size: 15/16" x 1-11/16"
Impression Size: 1" x 2-3/16"
Impression Size: 1-1/2" x 2-5/16"
Impression Size: 15/16" X 1-3/4"
Impression Size: 5/32" Date - No. 1-1/2 size line dater.